Cusco – This amazing city was once the ancient city of the Inca Empire and is now considered the Archeological Capital of the American and a UNESCO World Heritage Site. The elevation of the city is quite high at 3,400 meters, but that does not discourage the more than two million people who visit every year. 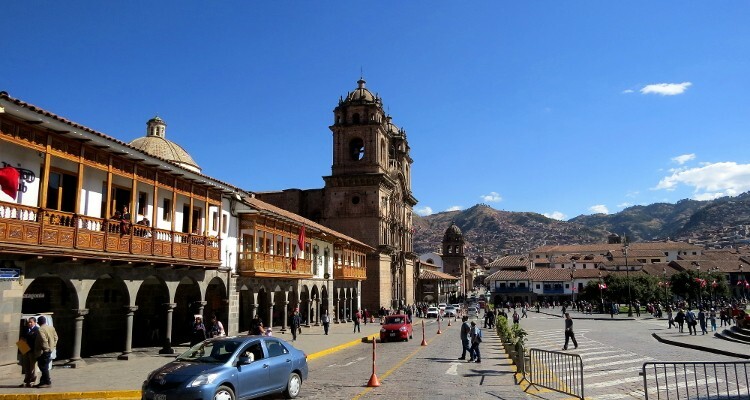 Of course, those two million plus people need something to do while in Cusco, and they are all amazed at how much there really is to see in this spectacular area of the world. This plaza is in the center of this historical town and it is the most recommended place for every visitor to begin their Cusco experiences. There is not a lot to do in the square, but the views of the buildings are quite the sight and visitors will enjoy walking around. This was Cusco’s first cathedral and construction began on this building back in 1560. The red granite blocks on the outside may be impressive, but the inside offers even more beauty with colonial gold. Not too many visitors are aware of the fact that this cathedral, like many of the other buildings in the area, were designed and constructed to withstand the effects of mother nature’s earthquakes. This cathedral is right next to the Cathedral of Santo Domingo and was originally supposed to be more magnificent once it was completed. However, the people in charge of the construction were forbidden to even try to make it better than the Santo Domingo. This was once the most important temple of the Inca Empire and was called the House of the Sun. The walls were covered in golf at one point in time and there were gold statues in both the niches and the courtyards. All the gold is gone now, but the foundation has not been changed over the years, despite the fact that the church addition is quite new. The hike to this ancient military fortress is slightly difficult, but the views that visitors see during the walk are breathtaking. This area was most likely phenomenal a long time ago, and while it is still nice to see, not much remains except a few foundation stones. The best time to visit this area is when the Festival of the Sun takes place from sunrise to sunset during nine days around the winter solstice. This statue was designed by a local artist named Francisco Olazo Allende and while many people think that they need to go to see the statue up close, that is not the case. The statue is best viewed from a distance, but the best views of Cusco are from the statue’s platform. Many visitors stop in the San Blas quarter after their visit to Sacsayhuamán, because it is quite close by. This area is full of craft shops where local artisans create authentic souvenirs and other items. Anyone who doesn’t love to shop will still want to stop by, so that they can see the steep cobblestone roads. While in the San Blas quarter, people should stop at the little church to see an amazing wooden pulpit that has an intricate baroque design. Audio guides are available to visitors which explain the multiple myths of the construction of this pulpit. This is one of the few museums in Cusco and it is the one that is most recommended. The museum has many modern displays that are filled with high-quality pieces of art as well as a lot of gold. The inside of this palace has numerous spaces, but none are as fascinating as the Golden Hall. This room has been used as a reception area by the archbishop of Cusco. The entire interior has a colonial feel and yet, the courtyard is charming and intimate. The Twelve Angled Stone can be found within the Palacio Arzobispal and this palace is a wonderful way to see how many of the old palaces looked back in ancient times. While the Twelve Angled Stone is one of the sights that many people see, no one should discount any of the other areas of this palace, because they will miss a really spectacular setting. This market is authentic and takes up an entire quarter of the city. There is no item that is not available within this market and people will need to spend quite a bit of time exploring everything that is within the stalls and booths. The exhibits within this museum are a little dated, but it is inside an old palace, which makes it worth the time. Some of the ancient palace walls have survived over the years, so visitors can see authentic Inca construction firsthand. A day trip to Machu Picchu is possible for those who want to quickly see one of the seven wonders of the world, but no one will get the best experience that way. However, it is a great way to see the lost Incan city when a person does not have much time in the area. Tipon is a ritual water garden that is still unknown by many tourists, despite the fact that it is only a couple miles away from Cusco. There are twelve terraces to explore before reaching a water temple at the top. The water is channeled throughout the terraces and turns it into a sight of amazement. These salt ponds have been around since the Inca times and while they are not easy to reach, people can get to them through the Urubamba Valley. Once a person arrives at the ponds, they will be greeted with spectacular views of the water that glitters in the sunlight. There are numerous Inca ruins in and around Cusco, and while seeing too many of them is not recommended, there are a few that people should consider. Those ruins include Ollantaytambo, Tambomachay, Q’Enqo, and Piquillacta. They are all different, which is a good thing, but most people will want to choose one or two and leave the others to the rest of the tourists. This planetarium offers tours where people can go and look for stars in the all-expansive sky. The stars are fabulous in this area, because the ambient lighting in the city is low and the sky brightens the nighttime sky. There are two luxury trains that depart from Cusco and while they are a little expensive, the views and the experience is worth the cost. One of the trains goes to Machu Picchu and the other goes all the way to Puno and Lake Titicaca. Hikers will want to visit Ausangate to trek along the Willkanuta mountain range. The views and the history of Incan mythology will only add to the experience. This city is vibrant and busy, even on a rainy day, which is a good thing for every tourist. Visitors will want to be ready to do a lot of walking while they are visiting Cusco, so that they do not miss out on any views or attractions that they have to see.